C Squares® are your absolute best choice of a Broken Squares Game in the United States. They are the first and foremost singular U.S.Patented Product / Process that utilizes the Broken Squares Game model to facilitate evaluation of cooperative skills of individuals in a group environment. 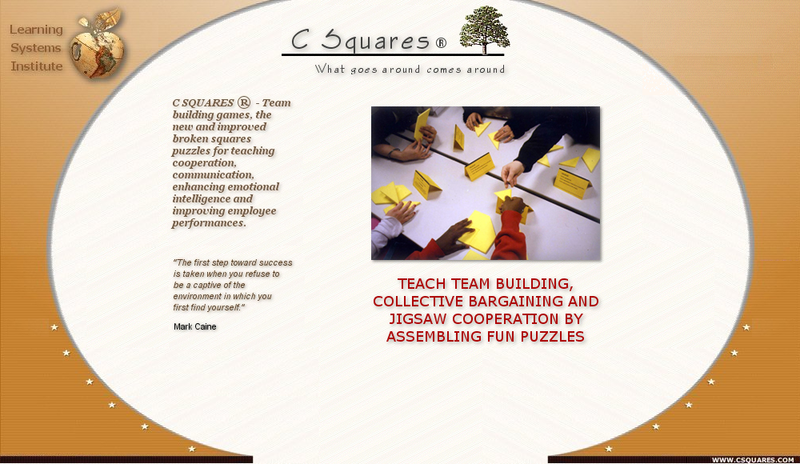 A team building activity that's a fun game to play, C Squares ® enhances emotional intelligence, builds trust, models cooperation, improves group patterns of interpersonal communication, teaches collective bargaining, compromise and successful negotiation. C Squares ® are an effective means of improving employee performance through group process, providing a problem-solving metaphoric win-win demonstration every time. Like traditional jigsaw puzzles, C Squares ® are a conventional means of introducing Broken Squares Game playing fun to promote learning, laughter and promise the delivery of an abundance of practical, non-cognitive life skill insights. C Squares ® are also an effective mind-mapping means of team building and teaching negotiation and collective bargaining, as well as essential soft skills contributing to emotional intelligence. The Complete Training Kit has many applications. One purpose of this team-building exercise is improving employee performances. Another is using teamwork and group process to improve academic performance, competitive advantage and ability in sports by providing an experiential edge. C Squares ® illuminate those repetitive patterns of unproductive behavior that result in dis-functional mental maps. These registered Broken Squares are the sensible choice among team-building exercises. By improving employee performances, they provide professionals and practitioners alike with hands-on validation for normative behavioral change. Time is a limited resource where a team's success is marked by communication and emotionally intelligent choices. Use this Broken Squares Game every time the need for supervision, improving employee performances, and recurrent training coincides. Think of these Broken Squares before negotiation breaks down. An alternative to verbal collective bargaining sessions, these manipulative learning tools are the way to go. Indestructible, easy to use and sensibly priced, they ought to be the next team-building activity you include in your training package. Those human tragedies captured in all too familiar headlines containing accounts of environments rapidly changed or workplaces stressed to the breaking point can be averted by acts of compassionate creativity. "We may not have it all together, but together we have it all." Environments are made more, not less, safe when people living or working in them learn by means of collaborative action to see, feel and experience how we need one another. How it works: Each participant receives a number of pieces of like-colored poly-foam shapes. The goal of each person is achieved once they've assembled a square six-by-six-inches directly in front of them. All the pieces have to be used. Initially, no participant completes a square using only what they have. They must exchange pieces with other team members to obtain what they need to build uniform squares. Single players cannot achieve the mission until all other members have completed squares in front of them. There are many flawed ways of proceeding but only one way to accomplish the overall mission and ensure that every participant reaches their personal goal. Players may give pieces to other players but they may not take pieces or in any way signal a team member that they want something from them. It happens frequently in groups that one person will complete a square while the rest remain unable to do so. The participant with the completed square now has a choice, whether or not to break up their square and to redistribute pieces. Typically, groups that do best at this activity remain unattached to individual squares, focusing instead on the success of the mission and helping others complete their tasks even before completing their own. PURPOSE: To raise awareness of the importance of communication in solving problems. MATERIALS: Five squares of equal size made of various geometric shapes. The pieces of the squares are placed in white gift boxes rounded by red ribbon. Each participant is given a tent card which they place on the work surface before them. One side has rules, the other directions. Observers, facilitators, or team members may point to specific reminders on the card during the activity since a no-talking rule will be in effect. PROCEDURES: Have participants form groups of five with an observer and seat each group around a table or flat surface. Provide each member with a small white gift box. Explain the game this way: "Your task is to make five complete squares of the same size. No one will have achieved the mission of this objective until all members have that completed square directly in front of them." There are but three rules: 1. You may not communicate with each other (verbally or non-verbally); 2. You may not take pieces from each other; 3. You may, however, give pieces directly to other team members. Do not instruct participants to cooperate. They will soon discover that the only way they can succeed is by cooperating with each other. Once participants are familiar with the rules, let them begin. You may choose afterward to pose questions to the whole group. Some examples: How did your group begin the problem-solving task? How and at what point did your perspective change? How did you feel when you couldn’t complete all the squares? How and when did you feel the shift occur in the group's energy? How did the roles of group members contrast during the activity? How do you feel about what you did during the activity? How would C Squares ® be helpful to you in some other familiar setting?